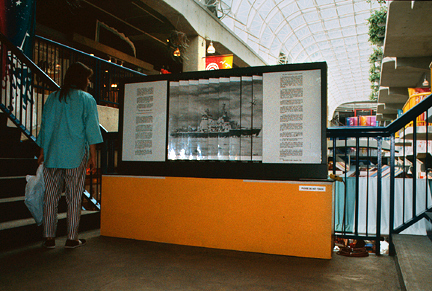 During July, North Shore artist Ross Muirhead will display Last Day at the Shipyards at Lonsdale Quay Market. The artwork resembles a billboard but, unlike most consumer advertising , it's rotating photographs and text question social progress. Ross has responded to the controversy around the future Versatile Shipyards and is interested in how changes in local industry impact on the cultural life in North Vancouver.